Centered in the heart of Downtown Dallas, Reunion Tower is located at 300 Reunion Blvd E, Dallas, TX 75207. Find out everything you need to know about getting here! Self-parking for visitors is available just a short walk from Reunion Tower. 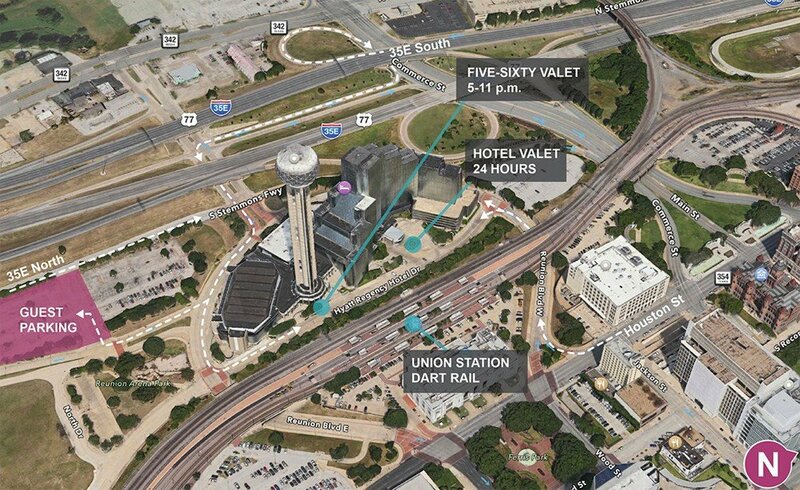 Valet parking is available for guests of the Hyatt Regency or Five Sixty restaurant. Merge onto Woodall Rodgers via exit 1A, merge onto I-35E South, take Commerce St E exit 428E, turn right towards Reunion Blvd, left on Reunion Blvd. Take the Tollway south, merge onto I-35E South, take Commerce St E exit 428E, turn right towards Reunion Blvd, left on Reunion Blvd. Take I-35E south, take Commerce St E exit 428E, turn right towards Reunion Blvd, left on Reunion Blvd. Take I-45 north, take exit 284A for I-30W, stay right, take exit 45 for Ervay St, take to Griffin St, left on Memorial St, right on Hotel St.
Take I-30 east, exit 44B towards Industrial Blvd, left on Riverfront Blvd, right on Reunion Blvd. Take I-30 west, exit 284A for I-30W, stay right, take exit 45 for Ervay St, take to Griffin St, left on Memorial St, right on Hotel St. Visiting from out of town? Stay at the best hotel in Downtown Dallas for the ultimate vacation experience! Located next to Reunion Tower, Hyatt Regency Dallas is a gateway to the best of the city. With contemporary decor, well-appointed rooms, and facilities including an outdoor pool and sundeck, 24-hour gym, and 24-hour coffee shop and market, Hyatt Regency is the perfect destination for visitors. Guests of the hotel also receive 20% off GeO Deck admission.